- Publisher For ten years, Verity Records has been the source for the best in Gospel Music, from the artists that you love the most. Always spanning the distance between the most traditional and the most contemporary, Verity has simultaneously produced rousing, foot-stomping and hand-clapping LIVE performance videos as well as progressive and compelling Concept video clips. For the first time, a collection has been assembled that displays the decade-long journey . . . the journey from faith to faith. This video chronicles the history, the legacy and the vision of Verity Records . . . and you have the best seat in the house! 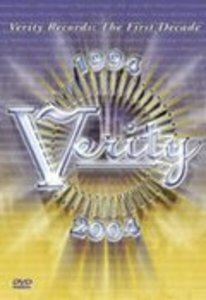 About "Verity Records the First Decade"
For ten years, Verity Records has been the source for the best in Gospel Music, from the artists that you love the most. Always spanning the distance between the most traditional and the most contemporary, Verity has simultaneously produced rousing, foot-stomping and hand-clapping LIVE performance videos as well as progressive and compelling Concept video clips. For the first time, a collection has been assembled that displays the decade-long journey . . . the journey from faith to faith. This video chronicles the history, the legacy and the vision of Verity Records . . . and you have the best seat in the house!